Beta tapes were used for home video recordings and distribution of Hollywood movies and may be found in videotape collections. The Sony Betamax format was introduced in 1975, about one year prior to the introduction of the VHS format. After the VHS tape format was introduced, a VHS versus Beta war began in the marketplace. This compares to the modern day HD-DVD versus Blu-ray format war that was eventually won by Sony’s Blu-ray format. However, Sony was not so lucky with the Betamax format. 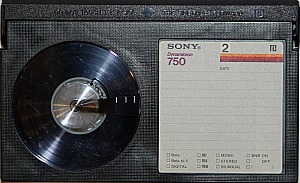 As time went on, due to a number of factors, Sony’s Beta format began to lose marketplace share and eventually Sony did have to abandon this videotape format and it lost the VHS versus Betamax format war. The following graph provides some statistical data, comparing these two videotape formats over a ten year period from 1978 to 1987. The bar graphs shows clearly that VHS became much more popular than Betamax. 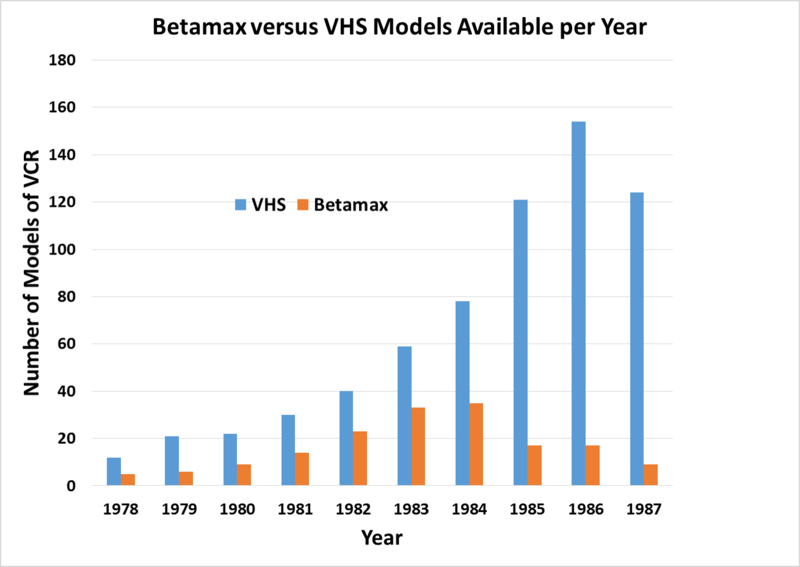 Whereas VHS VCR models rose dramatically during this time, Betamax VCRs rose slightly at first and then dropped. This data was taken from: Econometric Analysis of Price Index for Home Videocassette Recorders in the U.S. The last Beta machine was produced in 2002. Beta tapes continued to be manufactured until 2016 and at that point Sony discontinued them. VHS VCR manufacturing continued for many more years beyond Betamax VCRs, with the last VHS VCR being manufactured in 2016. The Betamax and VHS formats are both analogue video formats but are not compatible with each other. For example, a Beta tape cannot be played in a VHS player and vice versa. These tapes are ½ inch in width, like the VHS format, but the cassette shells are smaller. The earlier Betamax equipment was much smaller and lighter than the bulkier VHS equipment, but later on, the VHS VCRs became more compact. Overall, the Beta format produced better quality video than VHS. Betamax has a horizontal resolution of 250 lines, whereas for most VHS tapes, the horizontal resolution is 240 lines. The L-500 and L-750 Betamax formats were the most common and likely, the ones found in videotape collections. 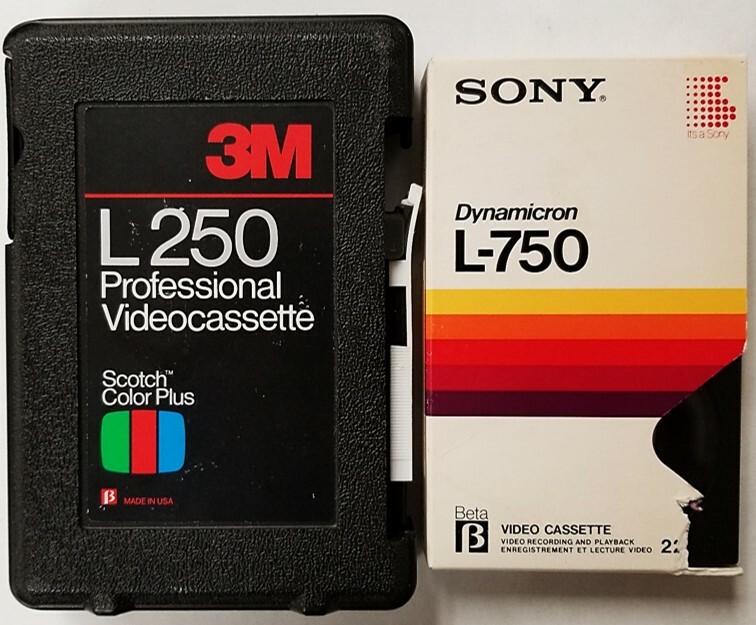 The picture below shows the L-250 and L-750 versions of the Betamax videotape format, found in a rigid plastic case and a paper jacket. What to do with Betamax Tapes? For people that have Beta tapes in their collections, it is best to act now in order to save the video content recorded on these tapes. Most individuals with Betamax tapes unfortunately do not have the corresponding equipment to play the tapes. They are essentially left with media and stored historical video content that they cannot access. Fortunately, used machines can still be purchased online from a variety of outlets, although the condition of the machines may be suspect. Buyer beware is the best advice if considering the purchase of these machines. The purchase of Beta VCRs for performing transfers should only be considered if there is a large amount of tapes in the Beta format in the collection. Otherwise, for a few cassettes, it would be more cost effective to have the transfer performed by an outside company that is already set up to do the transfers and has the necessary equipment. When considering transferring the content from Betamax tapes, the best option is digitization. With digitization of the video tapes, a DVD can be produced. Alternatively, the Betamax video tape content can be digitized to other digital file formats as well and stored on a hard drive or other digital storage format. Whichever file format is chosen, it is best to digitize the video as soon as possible. With every passing year, the availability of Betamax machines or machines in good condition will decrease. The tapes will also suffer from more deterioration and this will require that the tapes will have to be restored prior to digitization. Both of these factors will increase the cost of digitization, perhaps significantly.